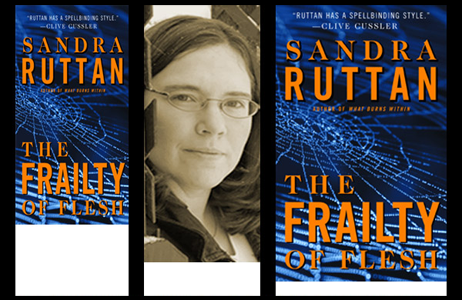 Sandra Ruttan’s latest novel, The Frailty of Flesh is the second in a gritty series following three Royal Canadian Mounted Police detectives solving crimes in British Columbia. Despite being Canadian, Ruttan is now based in Baltimore. She talked to Shots about the novel, what inspires her to write, and the challenges of selling Canadian crime fiction to the world. How would you describe your new novel, Frailty of Flesh to Sandra Ruttan virgins? Frailty is both dark and personal. Although the subject matter is distressing, one of the things I was pleased reviewers picked up on with the first book was that I didn’t exploit the crimes for cheap thrills. I handle the subject matter with sensitivity, and the reason I write about these types of crimes is because there are important things to say about family dysfunction, about abuse, and how dealing with these crimes affects the police. Do you endorse 'Rankin with ovaries' as a description of your work? And what do you think it means? Comparisons always make me a bit nervous, because there can be a backlash from readers. I’m a huge Rankin fan. The first author I had sign a book for me was Ian Rankin. I also think whether or not it fits is up to the individual. What’s dark to one person may be trivial to another, depending on their tastes and prior reading experiences. I do think that it’s possible to see a Rankin influence in my work, particularly with Frailty, and in my case I have a focus on family relationships that underlines the entire book. Perhaps that’s my maternal side coming through a bit, hence the reference to ‘ovaries’. Or maybe it’s just as simple as the fact that I’m a woman. I suppose there are things Rankin has dealt with in his books that come through in mine as well, like problems within the police department. We read things we find interesting, and we write about things we find interesting. I could actually see my character Tain going for those incredibly long walks in the dead of night. I could also see him listening to music, but not drinking. Tain has made a conscious choice to turn away from booze. Many Shots readers will be unfamiliar with the world of your characters purely because of the Canadian setting. How difficult was it to get a Canadian police procedural published? And do you think that says anything about the perception of Canada in the eyes of other countries? I banged my head against the wall for a few years, trying to get an agent to take on a Canadian-based series, or find a publisher. I couldn’t get a Canadian publisher interested, and what seemed to be the reason was that they didn’t want to publish something that portrayed a darker vision of Canada. Agents wanted something with a U.S. setting. I eventually found a Canadian agent, and they also suggested relocating the work, but I managed to get them to shop it with the Canadian setting, and it sold quickly. Canada likes its nice image. The absolute truth is that I’ve seen quotes from the families of tourists who’ve been assaulted or even murdered in Canada, saying they never would have believed that would happen in Canada. I’ve seen quotes from people within the literary community, suggesting the worst crimes to be found in Canada would be pinching money from kids’ lemonade stands. It’s a baffling view of an idyllic crime-free country that just doesn’t exist. My biggest problem with it is that as long as Canada holds on to its nicey-nice image, it’s hard to persuade people that there are serious issues that need to be addressed. Having read The Frailty of Flesh and What Burns Within, it seems to me your big idea as a writer is the way crimes often illuminate – or originate with – family breakdown. Is this how you see your work? I think that’s a fair assessment. I have a bit of experience working with children from abusive homes and would describe my own upbringing as dysfunctional, which is the norm now, but back then it wasn’t so prevalent. My mother is bipolar, and it took a lot of years for her to get the treatment she needed. When I was 17 I found her hallucinating because of an overdose, and when she got to the hospital she was fighting with the staff because she didn’t see hands, she saw maggots. She was in intensive care for four days before they stabilized her, and when she was released from the hospital she was sent to an institution. When I was much younger I remember her being away for a while. I really don’t know where or why. Nick Mamatas said if you wanted to be a successful writer, you needed to be prepared to have even your closest family hate you, because you’d pour your experiences on the page. My writing gives me a chance to explore some of my own experiences and sort through some things, but I say that with some caution. I try to never sacrifice the thread of the story being told for personal indulgences. Frailty features a lot of buried secrets. You think everyone has a skeleton in the cupboard, or is this more to do with the nature of crime fiction? There really are some people who don’t have skeletons in the closet, but not many anymore. I suppose crime fiction centers on people with secrets because many criminals do operate in the dark, they don’t broadcast their crimes. I also think there are things in our lives we don’t talk about sometimes because we’re still processing them, but they can influence our choice and behaviour. Frailty features three POV characters in Nolan, Hart and Tain. What sort of difficulties does that give you as a writer to juggle with three perspectives? What techniques do you use to distinguish the three narrative voices? I love working with three protagonists. The great thing is that the different relationship dynamics they have with each other allow me to reveal different facets of their personalities. We probably see the greatest range with Ashlyn, because of her personal relationship with Craig and her working relationship with Tain. At the same time, Tain’s apparent lack of a personal life allows me to occasionally slip things in unexpectedly. The only part I find challenging sometimes is deciding whose point of view a certain scene should be told from. You definitely have to watch which character knows what, or what they were thinking in a specific scene. As for techniques … I just follow the characters. They have their own values, beliefs, interests and potential conflicts of interest that colour their thinking. I have to try to make sure those things come through, but only if they’re relevant to the story being told. The relationships between Nolan, Hart and Tain lie at the heart of Frailty. When writing it did you start with the emotions or did you start with the plot and let the emotions follow? I guess you could say I started with the emotions, because the one thing I knew from the outset was that Craig and Ashlyn’s relationship would be put under enormous strain. Beyond that, I had to consider where we left off at the end of What Burns Within, and what the reasonable repercussions of those events might be. From there, I let the dominoes fall. I also knew there were certain things about each character that I wanted to explore. One, Craig’s relationship with his father, and how insecure Craig really is. Another, the horrific tragedy that’s been haunting Tain for years. The nature of the cases under investigation in Frailty allowed me to bring those things out in this book. I notice in places the book succumbs to some confusion over the use of the word partner to mean both sexual partner and cop partner. Do you think the increased influence of politically correct terms in fiction makes it harder for writers to craft arresting prose? It’s a definite possibility. I think the double meaning worked out well for one scene in Frailty, though. The simple reality is that I’m not sure political correctness should dictate how we write things, but when you’re dealing with a police force that’s trying to be politically correct you have to consider that. I bounced around on a lot of RCMP websites to find out if they referred to Natives, Aboriginals or First Nations, because I’ve heard all of those terms used elsewhere. Trying to get things like that right can be frustrating. You’re quite a stickler for realism in fiction. What research did you do for Frailty? I had to research things like typical sentences for certain crimes within Canada. It’s disturbing to realize that murderers can sometimes be paroled in just ten years. Actually, one of the true stories that influenced Frailty was about a family that was preparing for the upcoming parole hearing of the man who’d killed their daughter. It had been a particularly gruesome murder of a teenager, and just ten years after the conviction they had to go to speak to the parole board about their loss and try to convince them that their daughter’s killer should stay in jail. That story really bothered me. I don’t know how these people can ever move on when they have to revisit the crimes again and again to try to keep a convicted killer behind bars. I work within the realm of realism, but that doesn’t mean there aren’t liberties within the work. I aim for what’s plausible. You’ve spoken in the past about how you turned to and then rejected organised religion in your youth. Do you have an alternate belief system which is reflected in your work? Some of my beliefs will filter through the work. In What Burns Within the notable one is about affirmative action with fire departments. In terms of any religious philosophy … That’s harder to say. My own beliefs are hard to pin down. Frailty name-checks a couple of books such as Steve Mosby’s The 50/50 Killer or Tom Piccirilli’s The Fever Kill. Is this your equivalent of product placement? It’s my way of giving nods to works that I admire, but having said that, I also carefully consider what I really think my characters would be interested in reading. I should add that anyone who’s read those two books will see some parallels with the underlying themes in Frailty. You have several influences, from Laura Lippmann to Ian Rankin. Have your reading tastes changed since you’ve been publishing your own work? If so, in what way? Yes, my tastes have changed. For one, I’ve become more discerning as a reader. The more I learn about the craft, the less tolerance I have with lazy writing. I know you don't want to be nasty to anyone, but can you give me examples of writers you've moved away from or ones you started reading after being published? I don’t want to name names, but there’s one author I own about twenty-five books by that I’ve stopped reading. The reason is because it felt like every book was the same book, just with a few swapped out secondary characters. That said, I think the author has since stopped writing both of the series that I’d followed, so perhaps we hit the same realization around the same time. I know they have other work out there that I may some day check out, hence avoiding the use of the name. Saying I read their books for pleasure almost sounds a bit perverse, doesn’t it? One other thing: I deliberately pushed myself to read more American authors. I cut my teeth on British crime fiction, but I have had to learn to understand the American publishing scene, since I have a US publisher. Now, I’m asked to review books or blurb authors, so I read a lot of debut authors or the kinds of book that get pushed by publicists, but I make a point of going back to writers who consistently deliver on the page. I read the best to remind myself how high the bar is set. You’ve recently agreed to a deal with Dorchester for the third book in the series, Lullaby For the Nameless. Does Dorchester demand any interesting restrictions on content or style that you can tell us about? No. Dorchester has been great about the content. There’s only one thing they asked me to consider so far, and that was to find a way to inject a little hope in the ending of Frailty. The compromise was to take one shade of dark off it, but all that required was the deletion of one sentence. It didn’t change any of the substance of what happened. Can you give us a sneak preview of what Lullaby For the Nameless is about? In What Burns Within and Frailty, the past case Nolan, Hart and Tain worked on when they first met has been alluded to, but never fully explained. In Lullaby For the Nameless readers will find out. When a current case ties directly to the old case it brings back unpleasant memories. Instead of using flashbacks and memory sequences the story will be told with intersecting timelines. It’s an interesting challenge, going back just a few years, and writing the characters as they were then. This case was Ashlyn’s first plainclothes assignment, and she’s green. She has to find her feet and her self confidence, and this predates her relationship with Craig, who she’s actually partnered with in this book. Changing the relationship dynamics is interesting and allows me the opportunity to get to know the characters better. I notice on the Dorchester website you’re running a competition to name a minor character in Nameless. Can you tell us more about this? Anyone who’d like to enter to win a chance to have a character named after them in the third book can send an e-mail toSandra@sandraruttan.com by December 1. There’s a trivia question – what police department do Nolan, Hart and Tain work for? – and the answer should be in the body of the e-mail. Subject line ‘name contest’. I’m actually a character in a novel by John McFetridge, called Swap. I’m not sure when Swap is being published, but although part of my name has been changed, I have a walk-on role as a member of a wife-swapping club. I like the idea of having a wild fictional life, because that’s not at all like the real me. I think it’s fun to allow people to have the chance to have a fictional identity. You’re also publisher and editor of the Spinetingler webzine. Now that you’re busy with contractual obligations, what does the future hold for Spinetingler? I currently have a good team in place, helping with Spinetingler. As long as we’re able to continue producing a quality ezine we’ll continue. We’ve trimmed back to three issues per year, and we’ve cut those back to six stories per issue as well. We want to maintain a high standard. I hope we can keep it going for another few years, anyway. Time will tell. That said, I’m also interviewing and reviewing for Mystery Bookspot, and that means that I can continue doing those things as time allows, even if we have to end Spinetingler at some point in the future. You’ve been interviewed quite a few times for someone who’s only had three books published. Tell me, are there any questions you always wanted to be asked but never have? I can think of things I haven’t been asked about, like my near-death experience and why I didn’t graduate from high school, but I’m not sure I’d go so far as to say I’ve always wanted to be asked about them. I don’t mind any question, though. At least, I haven’t minded any question I’ve been asked so far. So, would you set a book in the US now that you've spent a fair bit of time there? The short answer is yes. One of my hesitations was because I'd heard of Canadian writers moving their works south, and being criticized for getting something wrong. The reality is that when you haven't lived in a place or spent a lot of time there, you just aren't going to know the setting as well, and then you're more likely to make mistakes. I also felt that my writing usually has political shots that crop up in it. Not about politics per se, but about government agencies like social services, and I think we have to be very careful about pointing fingers at other countries if we don't really understand how their society works. A lot of people assume Canada and the US are so similar it shouldn't be a big deal, but from living here for six months I understand just how many little things are different, things I might otherwise get wrong. For example, the other project I'm working on at the moment is being set in the area I live now. When I'd originally thought of the idea I'd thought about setting it where I grew up in Ontario. It was reasonable to have an outcast Native boy in that setting. When I decided that the setting would be in Carroll County that seemed less reasonable, because of the local demographics. I may still have the character be Native, but I need to carefully consider that. If I don't feel it would be plausible to most local readers, I'll move in a different direction. And then there are other little things, like the fact that here they have Chick Fil-A, but they don't have Harveys. I can't run into Beckers and grab a Mars bar here, and to me, that's an example of the kind of thing you need to know to capture the essence of a setting. Also, as a Canadian, do you find using a US-English spell check irritating? Well, we’ve been dealing with that for years, and we read books that come straight from the US, so not really. When I’m typing an e-mail I just ignore the red line, because my natural instinct is still to spell words with the u, for example. This is actually something that my stepchildren find confusing. The other day my stepdaughter asked, ‘What’s this word? C-o-l-o-u-r.’ She knows how to spell words harder than that, but this was the introduction of a new concept. I explained it’s colour, but that in Canada we spell it differently. My stepson followed that with a typical kid question – ‘Why?’ Try explaining that one. I once set my spell check for UK spelling, and at that point I realized that Canada really does have its own English, because although we spell many words the UK way, there are many words we spell the American way. Interviewer’s note: the preceding text was spell-checked using the Canadian-English option on certain world-famous brand name word processing software to give you good people the authentic Canadian reading experience. Enjoy.